Fabric Tension Table Displays are a very effective way to get your message across at any convention. The full color graphic prints colorful and clear and are printed on high quality fabric material. 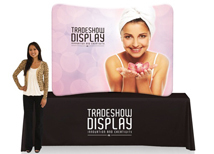 These trade show displays are 2/3rd's the height of standard pop up dis plays making them ideal for table top conventions. 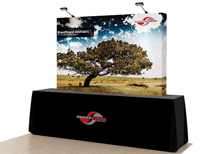 We also offer many other styles of table top displays that are affordable and very easy to transport. 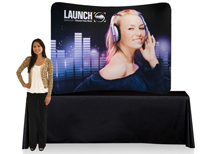 We even have a full selection of table throw that will make your display your entire booth professional and colorful. 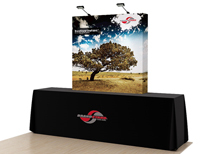 Fabric tension table displays are a great option because of the seamless fabric graphic that is sharp and clean. 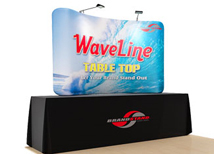 These displays are easier to set up than standard table top pop up displays because the fabric graphic attaches quickly and easily to the frame. There are no parts so assembly is usually less than one minute. 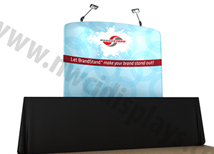 These trade show stands are also very portable making travel a breeze.